So, I got the Dr. Feickert's Adjust+ 7" Test LP in the mail the other day direct from Germany. It looks well pressed on good quality vinyl. It's great to see the measurement screenshots from Michael Fremer for the various turntables reviewed so I thought it would be interesting to do my own measurements with the Technics SL-1200 (M3D) here at home. I believe that all the Technics SL-1200 quartz-controlled direct drive units (MK2 onwards) have the same servo mechanisms so they should measure similarly. I'm using the current PlatterSpeed iPad app (v.2.2) to do the measurements in concert with the Test LP. MUSINGS: "Pure, Perfect Sound - Forever"
Remember that much-maligned phrase "Perfect Sound Forever"? Of course you do! For the audiophiles out there who read the usual magazines, how can we not!? We only seem to be reminded of it every few months as it's trotted out like a nagging parent bringing out old transgressions - never forgiven, never forgotten. This demo disk consisted of 14 tracks; combination of rock/pop (Elton John "Blue Eyes", Dire Straits "Once Upon A Time In The West"), with classical selections [see here]. Personally I have never seen a copy but can imagine that it would sound like the usual early pressings - a first pressing Billy Joel Piano Man perhaps (which incidentally needed de-emphasis processing to sound right [see list]). As a marketing slogan, it has obviously worked. After decades, at least within the audio world, apparently people remember the "promise" of digital audio. I would of course agree that these early 1980s "first press" CDs were not the "ultimate" best sounding audio, but as I opined previously here (in reference to Pono and John Hamm's comments), just what is the best version of any album is a subjective judgement irrespective of whatever carrier medium... There have been many instances where I would easily prefer these old releases compared to modern dynamic compressed, distorted remasters (the inferior 2009 UMG Rolling Stones remaster of albums like Emotional Rescue from 1980 came to mind the other day as I was listening to it). The issue with the interpretation of this marketing phrase with many in the audiophile press and analogue evangelists when they malign "perfect sound forever" is that they're taking it to mean "best sounding version forever". Furthermore, some folks take this advertising slogan and heap upon it their own unfounded biases against digital as if the phrase somehow is evidence of an inherent "flaw" with digital audio! Remember, it has been 30 years since the introduction of the CD technology and we have yet to see credible evidence to demonstrate that well-digitized 16/44 isn't transparent beyond anecdotal opinions (just like there's no good evidence to demonstrate superiority of 24-bits or >44kHz sampling rates; assuming we're using a decent DAC playback system). In the context of what I wrote previously with my adventures in analogue/vinyl, I believe that "pure, perfect sound - forever" as it relates to digital is more accurate than not. Let's look at the mains points. Perfect: In reference to a digital sound storage system (ie. the CD and modern day digital files), one can say that perfect retention of the data and replication of the sound as encoded in the data is possible (or at least perfect enough for all practical purposes). It does get a bit boring measuring DACs these days because typical high quality DACs measure and sound very similar (atypical ones that employ vacuum tubes output stages or complex internal DSP operations for example, are a different matter!). I suspect it is this fact that leads various companies to shift attention to tiny differences like "jitter" to differentiate themselves or claim audible differences. 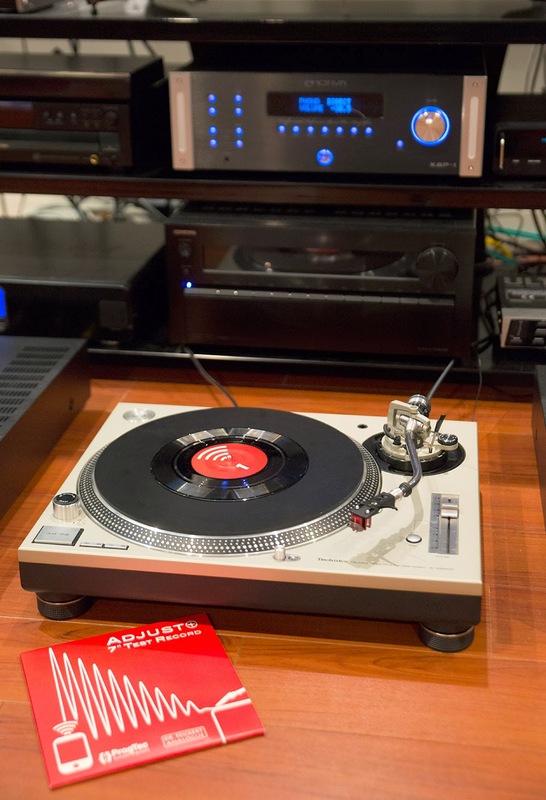 In comparison, you can never say that any aspect of a vinyl system's music reproduction is "perfect". The mixing process for an LP requires compromises, the cutting itself could be imperfect, mass reproduction does not result in perfect copies (consider even the varying quality of the vinyl material used), packaging and shipping issues (abrasions, warped records anyone? ), accidental scratches, dust and grime, imperfect turntable setup (VTA, VTF, azimuth, leveling, antiskating...), varying quality of cartridge/stylus/cantilever (tracking issues, inner groove distortion), phono pre-amp RIAA curves, etc. Compared to the data integrity of a digital system, analogue just cannot match. The consistency of playback with digital would have had been revelatory back in the day; certainly a much more consistent quality of playback each time and sonic differences between good CD players are much smaller than that between different turntables and cartridges. As I wrote previously, I do believe analogue LP playback can sound fantastic and IMO there's no point rehashing the tired analogue vs. digital debate since there are so many factors influencing a good sounding recording and playback system. Yes, some LPs can sound better than some CDs and vice versa. Digital has fantastic sound quality if the original source isn't dynamically squashed to distraction, and vinyl has attached with it the pride of ownership unmatched by CD/SACD/DVD-A/Blu-Ray/files. Forever: If anything, this is perhaps the least true comment about CDs. As an enduring object, the petroleum-based, non-biodegradable vinyl LP cannot be beat by digital as far as I am aware. It has been said that an LP can last 100's of years if stored properly. Easily spanning any of our lifetimes. On the other hand, there are instances of CD "rot" over time although personally I have many CDs hitting 20 years and they look good so far. Even 15-year old CD-Rs seem OK to me so far stored in a cool basement away from direct sunlight or inclement weather. Hard drives are more problematic and in the last 10 years of running my music server, I've probably had to replace each hard drive every 5 years on average with regular use. Solid state drives (SSD) are a bit of a mystery to me so far. I use them as boot drives rather than music storage due to cost and so far my oldest unit of about 5 years seems to be OK. However, with digital, we do have the ability to make perfect copies each time so with some discipline around backing up (probably good to have 2 extra copies around stored at different physical locations), one should be fine for a lifetime. PCM is ubiquitous and the free FLAC file format I suspect will easily outlive any of us reading today... I wouldn't be nearly as confident about DSD file formats' longevity however (especially given how primitive they are). 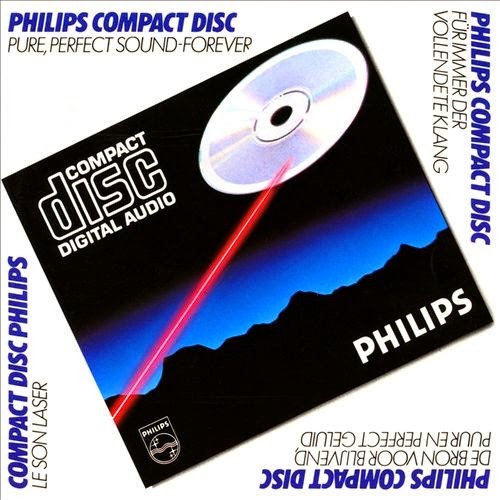 "Perfect sound forever" as a description for the CD and digital audio in general has a 'ring' of truth to it. The key is to say it within a reasonable context and seeing it for what it was meant to be... A catchy ad slogan which did highlight the merits of digital audio. And it worked! As imperfect as vinyl is, I'm having a blast rummaging through the bargain bins sorting through the oldies from the 70's and 80's constituting memorabilia from my "soundtrack of life" through the formative years :-). I've found many very clean, essentially mint albums over the months. To be able to buy it for "pennies on the dollar" makes it even sweeter! One last thing. Needless to say, economically, there is one very important reason for music labels to "push" for a resurgence of vinyl. Anti-piracy. "Perfect sound forever" also means "perfectly copied forever". I sure hope we don't get a systemic situation where digital becomes maligned, crappy CD/digital downloads are released, and sonically decent versions are reserved for the LP release only at high prices. Doing so would sadly bias sonic quality towards the technically less accurate format. Enjoy the music and the rest of summer (N. Hemisphere)! I was offered the opportunity by Archimago to share a few thoughts regarding the Dragonfly v1.2 which I graciously received as a pre-wedding gift from my good friend the Mago himself. However, before I go into that, I'd like to provide a little background on how I feel the entire subjective high end audio hobby has changed over the past two decades or so. This leads up to why I believe that the majority of consumer electronic products have mostly reached a technological performance plateau over the last few years and why I don’t think there are really any truly “bad” audiophile products out there any more in general. First of all, I've followed the general evolution of the high end-audio scene off and on for the greater part of two decades and have shared insights with friends from both the subjectivist and objectivist camps; with members of both camps invited for hi-fi auditions on a few occasions which led to some very interesting dialogue ☺. [Ed: War!] As for myself, I feel that I’m currently straddling both sides, being able to recognize the merits (and flaws) of each. However, over time, I feel that there will be some kind of eventual reunification as the once elusive “high end” audio performance can now be obtained at far more attainable prices. The one area in which all audio enthusiasts can unanimously agree to is that digital audio has improved significantly over the last 20 years, with the overall performance bar taking a quantum leap in the 90s, and then having that state-of-the-art performance trickle down gradually into much less costly products since the turn of the millennium. I still vividly remember being in complete awe with mouth agape when I first saw the Mark Levinson No. 30 and No 31 DAC and transport combo at a local high end store in the early '90s. That combo was insanely expensive, costing more than a new luxury car, and looked like it could have come off the captain’s quarters from Star Trek: The Next Generation’s USS Enterprise. It didn’t just sound incredible, it was the pinnacle of acoustics, aesthetics and literally cost-no-object build quality that made it widely regarded as the Holy Grail of digital high end audio for several years to come. It would have been my “preciousss” had I been able to afford it. Mark Levinson No 30 Reference Digital Processor (Photo courtesy of Stereophile, Feb. 1992). Although it cost a whopping $30K back then, it was so far superior to the quality of cheap mass market consumer electronic products at the time that if one could afford it, it might possibly be justified, like buying a Ferrari. Even today, the No. 30 and 31 are still sought after as icons of audio history. Fast forward a few years and I was similarly awestruck when I saw my first HDTV feed on a 42” plasma display which at the time cost a cool $25K. Today a 42” LCD TV that is superior in every way would sell for closer to a hundredth of that price. 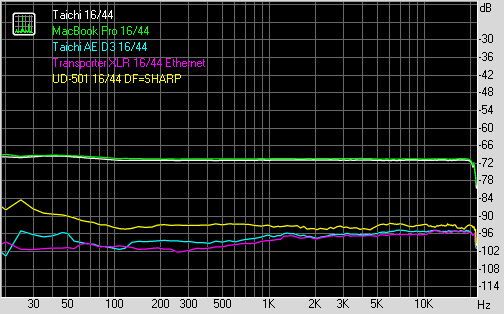 Similarly, audio electronics have also advanced significantly in price-to-performance. 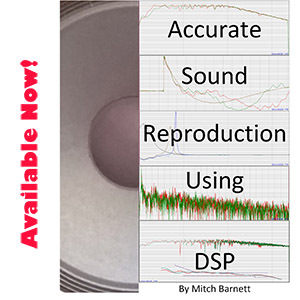 Archimago not long ago measured my Oppo BDP-105 which had a measured performance that is off the charts, with noise and distortion levels that are significantly below the thresholds of human hearing acuity. 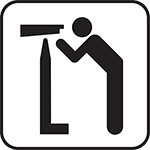 In fact, I believe that the “perceptible” (as opposed to measurable) performance of most consumer electronics products, which includes everything from digital cameras to flat screen displays to audio products have reached a plateau several years ago so the continued marketability of these products have primarily come from improving aesthetics and at the same time drastically reducing prices. Stepping back to the subjective camp for a moment, I will make mention that Archimago stated that he feels that the Dragonfly gives an overall “warmer”, more pleasant and less hard-etched sound than the AudioEngine D3 despite a bit inferior measured performance. I think that’s yet another example of the paradox that fuels the never-ending debate between the subjective and objective camps. If the original audiophile goal should be to seek the most accurate reproduced sound possible, why do subjectivists (or even normal human beings without the “golden ears”) seem to often prefer euphonic distortions in the form of tubes, vinyl, etc.? However if the ultimate goal is to simply enjoy the music, then should we even care? Finally, I will say a few words on my overall impression of the Dragonfly, but really, there is nothing much more that need to be said that hasn’t already been covered by many others before. It is well made and feels like a very solid and weighted USB stick. I never had the chance to do an intensive A/B test with it but the Dragonfly does a fine job of radically improving the headphone output from my MacBook Air which is most obvious when listening to AKG K-702 headphones, even though it is still a very noticeable improvement even with cheap earbuds. The soundstage is much larger, with instruments having far better stereo imaging and voices had more body and depth. The Dragonfly was able to extract significantly more micro-details, especially on live recordings so it is able to more convincingly put you at the recording venue when compared to listening straight off a MacBook Air or iPhone. The bass is full but not bloated. Overall, the sound is detailed yet well balanced and smooth. There was minimal listening fatiguing even after a couple of hours of critical listening, and I was able to listen at louder than normal levels. Overall, this nifty $150 DAC offers exceptional price-to-performance much like a $500 DLSR or LED TV, or the latest Android smartphone or many other techno gizmo these days. 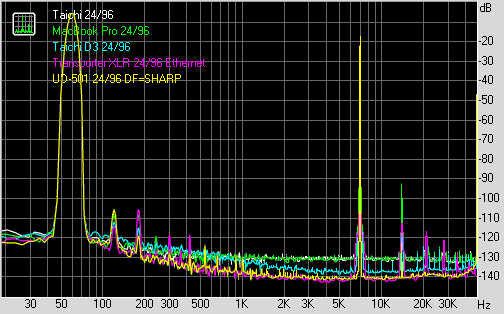 Heck, it may even sound as good as the revered ML No 30 DAC (in a DBT, of course) if plugged into my main system. Near state-of-the-art performance in consumer electronics products has never been better or more attainable. An audiophile buddy of mine (AudioPhil) got married a few months back and a few of us decided to chip in to give him one of these Dragonfly DACs for being a good sport :-). I don't think the Dragonfly requires much introduction since it has been around in the 1.0 iteration since 2012 and Stereophile had it grace their cover page with a full review back in September 2012. It uses an unspecified ESS Sabre DAC (not sure if confirmed, likely the ES9023 with integrated 2Vrms driver - there's also the older ES9022 chip) and the USB communication part is the TI TAS1020 performing asynchronous data transfer. I haven't read anywhere if these parts have changed in the 1.2 version. Supposedly, the new version has improved sonics ("Even smoother and more open sound!" seems to be the official tagline). It looks good and feels great in the hand with a slight rubberised texture to the surface of what seems to be a metal shell underneath. As you can see above, it is slightly smaller than my AudioEngine D3 previously tested. Despite the smaller size, the weight on the Dragonfly feels heavier; hence a noticeable ruggedness and density to the package. 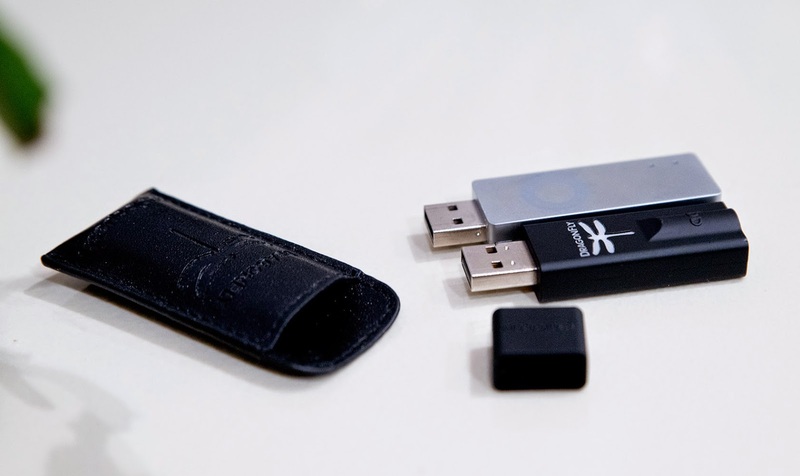 It comes with a small black pouch for safe keeping along with the USB cap. I don't think the Dragonfly comes with a 1/4"-to-3.5mm adapter cable like the D3. You can see the Dragonfly indicator change color depending on sample rate. AKG Q701 connected. In use, I found that it didn't get too warm and was clearly cooler to the touch after about an hour of listening compared to the D3. AudioEngine was quite open about revealing the use of the LME49726 op-amp for the headphone output and presumably the Dragonfly utilizes the integrated op-amp function of the ES9023 (or similar chip) as per the "direct-coupled circuitry" in their promo material. From a price perspective, both the AudioEngine D3 and Dragonfly are priced similarly, $150CAD for the Dragonfly and $170CAD for the AudioEngine D3. Other specs like output impedance (12 ohms Dragonfly, 10 ohms D3) and power (150mW Dragonfly, 200mW D3), both being driverless USB Audio 1.1 devices with a maximum of 24/96 sample rate (it is capable of the important 88kHz for DSD conversions) further adds to the functional similarities between the D3 and Dragonfly. These driverless USB DACs make it really easy to just "plug 'n play" with Windows and Mac OS X - I did not try using Linux but that should not be a problem. Sine wave at 0dBFS. No clipping at 100% volume. Peak volume of 2.63V correlates with an RMS voltage of 1.86V. Hmmm... I suspect this must be what they did to avoid clipping if the ESS chip used is the ES9023 with 2Vrms capability; dropped the highest volume level settings (notice that the Geek Out test posted was with 100% volume at 2Vrms). There is bit of channel imbalance in the graphs above... 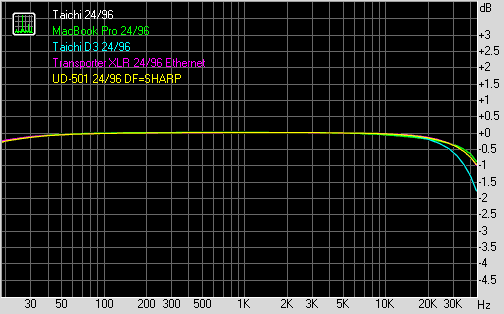 It represents approximately a 0.5dB difference (left channel louder) at full 100% volume. Impulse response is the typical symmetrical appearance of a linear phase oversampling filter. 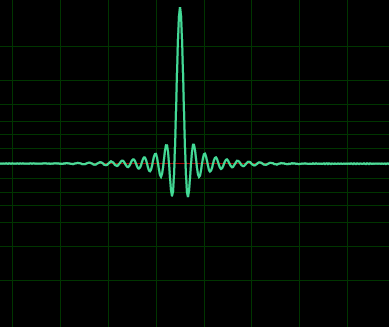 The signal maintains absolute polarity. No surprise. 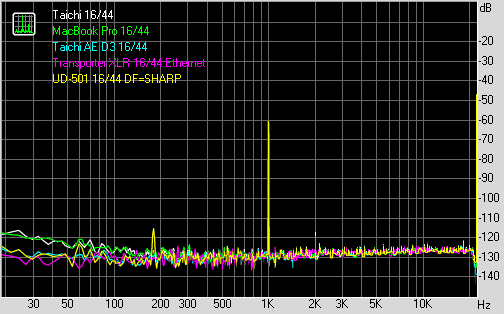 Okay, with the above done, let's have a look at the resolution of this DAC using the RightMark test bench. Like with the AudioEngine D3 tests, this was performed with the latest free version using the ASIO device interface. As you may recall when I tested the AudioEngine D3, I measured that device with 6 different machines! It was clear that this made no difference to the measured audio output (and I heard no difference either - indeed folks, bit-perfect does mean something)... For these tests, I just chose a PC platform and a Mac platform, both are laptops, but with major differences like OS, file types (FLAC vs. AIFF), different generation Intel CPU, different player software, USB2 (Mac) and USB3 (PC). The 2 columns on the left are the measurements from the Dragonfly 1.2 - leftmost using the ASUS Taichi laptop, second one using the MacBook Pro. 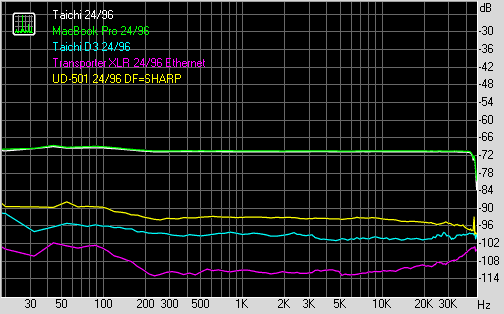 The middle column is the result from the AudioEngine D3 connected to the ASUS Taichi (exact same cables and setup as the leftmost column measured the same day), and the last two on the right are with my higher end DACs - the Transporter using XLR connection, and the TEAC UD-501 with XLR output measured awhile back. Note that because the AudioEngine D3 clips at 100% volume, the measurements were done at 91% which approximated the same maximum output voltage as the Dragonfly. Frequency Response - Transporter seems to roll off a wee bit more. Stereo crosstalk - note the significant difference between the Dragonfly vs. the others. The columns are arranged the same as above. Leftmost two columns represent the Dragonfly results, then AudioEngine D3, then the Transporter (XLR), and finally TEAC UD-501 (XLR). Again, no difference in results between using the ASUS Taichi and MacBook Pro laptops despite disparate hardware and OS. The Dragonfly is indeed capable of >16-bit dynamic range, and at approximately 106dB, that's about 17.5-bits (same as what Stereophile found with their v1.0 review). As with 16/44 above, however, when you look at the measurements of distortion, the AudioEngine D3 is capable of less distortion and dynamic range is about 0.5-bits higher. Needless to say, the stand-alone "higher end" DACs like the Transporter and TEAC UD-501 with XLR outputs handily beat these little USB DACs by about another 'bit' of dynamic range and lower noise floor (especially the old Transporter!) measurable within the limits of my ADC set-up of course. Noise level - notice Dragonfly slightly higher especially in the bass. Stereo Crosstalk - Dragonfly again significantly higher crosstalk... Very impressed by the Transporter using XLR cables! 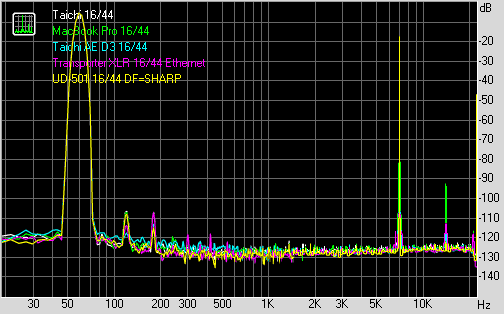 As in previous tests, with these asynchronous USB DACs, the Dunn J-Test spectrum generally looks fine. This is the situation here, no evidence of jitter issue at all using this simple measurement... Only very slight noise floor differences between the two laptop machines. So I asked my buddy AudioPhil (the guy who actually owns this Dragonfly) to provide his subjective review and it looks like he'll be providing a little write-up of his own in the next while... While that's in "gestation", I figure I'll jot down a few of my subjective impressions and comparisons on this little device. I spent about 2 weeks listening to music with this DAC/amp (some before, and some after the objective testing) and comparing what I heard with the same tunes off the AudioEngine D3 and ASUS Xonar Essence One (which remains my primary DAC on the computer workstation). Each of the devices have quite different DAC architectures; Dragonfly with the ESS Sabre, D3 with an Asahi Kasei AK4396, and the larger Essence One using TI/Burr Brown PCM1795s (quite unfair comparison given that it's not a simple USB bus powered device!). 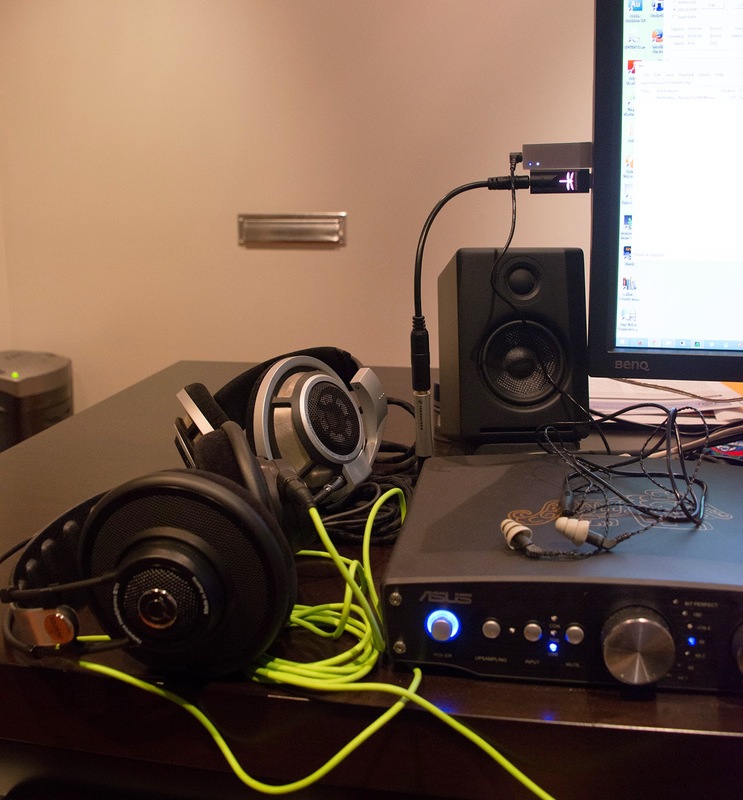 It's impossible to "instantaneously" switch headphones / DACs and then level-match compare... I tried my best. A potpourri of DACs and headphones: AudioEngine D3, AudioQuest Dragonfly 1.2, ASUS Xonar Essence One; Sennheiser HD800, AKG Q701, Etymotic ER-4B IEM. The published output impedances for the Dragonfly and D3 are around 10-ohms - the Essence One apparently has similar output impedance as noted by 'Xnoreq' in the comments although there are estimate of it being in the single digits [I'll need to have a look at this later]. So, to give them all a fair chance, I'll speak about what I heard using the Sennheiser HD800 (300-ohm input impedance) headphones primarily. Thankfully the HD800s have high enough sensitivity (102dB at 1Vrms) so music could be played reasonably loudly with the Dragonfly and D3 even with the lower power ratings. Of course from a price point perspective, the HD800 isn't the kind of headphone one would expect to see mated to an inexpensive USB DAC like this! I started with listening to some "vocal audiophile jazz" - Diana Krall's The Look Of Love (2003 24/96 DVD-A) being one of my favourites over the years and particularly "Let's Fall In Love" as a track I've been using to compare new gear with since around 2000. I like the instrumental portion in the middle of the track and particularly the detailed resolution of the bass and piano through that portion. With the Dragonfly, the piano sounded rich and full. The bass was detailed with each pluck easily discerned. In comparison to the D3, the Dragonfly sounds more laid back and "smoother". The D3 just seemed to have a bit more sparkle, slightly brighter; for example the high-hats on the song stood out a bit more from the rest of the instruments. Personally, with my "Anaxilus mod" Sennheiser HD800, I preferred the D3 rendition but I can imagine with even brighter headphones, the Dragonfly may be preferred. While staying with the vocal genre, I listened to some Nat King Cole - Cole Español (HDTracks 24/96 release, and no, I don't actually believe this album has enough resolution to warrant the high-resolution format). On a track like "Quizas, Quizas, Quizas", the Dragonfly was a joy to listen to with the HD800! This old 1958 recording can be a bit "brittle" through many DACs and the Dragonfly just made the instruments sound less harsh and the voice "ultra-smooth". I found the same on some traditional Chinese erhu recordings where the pleasant demeanor of the Dragonfly helped impart an enjoyable, smoother experience. Time for some heavier fare - how about AC/DC Back In Black (1988 DR12 CD)? Pump this baby up to rock! The intro to track 1 - "Hells Bells" - with those church (er... hell's?) bells sounded realistic in terms of the attack and smooth decay using the Dragonfly. While not exactly the paragon of audiophile recording technique, this analogue recording from 1980 is about as "hard" as I like my rock to be and the Dragonfly was able to render it nicely. However, I found the Dragonfly to be a bit more on the "polite" side of things as compared to the more aggressive sound of the D3 which I thought fits this type of music better. I listened to a number of other genres to get a feel for things - Pet Shop Boys Actually (2001 remaster), Yello Touch Yello (2009), Eiji Oue & Minnesota Orchestra Stravinsky: Song Of The Nightingale, Firebird, Rite Of Spring (1996 Reference Recordings), Ed Sheeran x (2014). In general, I thought that the Dragonfly performed well but was more at home with an acoustic set than say the synthpop or electric guitar rock. Despite the dynamic range compression especially near the end of the song, a track such as Ed Sheeran's "I See Fire" with overlaid vocals and relatively simple instrumentation found on x sounded just fantastic through the HD800 with the Dragonfly; bass response on that track was simply cavernous in depth. Not unexpectedly, the much larger (and unportable) ASUS Xonar Essence One sounded better than the USB stick DACs. This has more to do with the quality of the headphone amp than the actual DAC function I believe - providing a more full-bodied, powerful sound overall (even more cavernous bass at the end on "I See Fire"!). Near the end of my subjective evaluation, I put on some mono music to see if I could easily detect the channel imbalance noted above. For this I used the mono Beatles remasters from 2009. I listened to most of the Revolver and Sgt. Pepper's Lonely Hearts Club Band albums one evening. On the whole the stereo imbalance at normal listening levels with the Etymotic ER-4B balanced armature IEM (100-ohm impedance, excellent noise isolation) was subtle when I compared it with the output from the D3. I was concerned about perceptual bias knowing the objective results earlier so I asked my wife and she identified correctly the slightly louder left channel after listening for a bit. So, we're looking at a small, but perceptible imbalance. 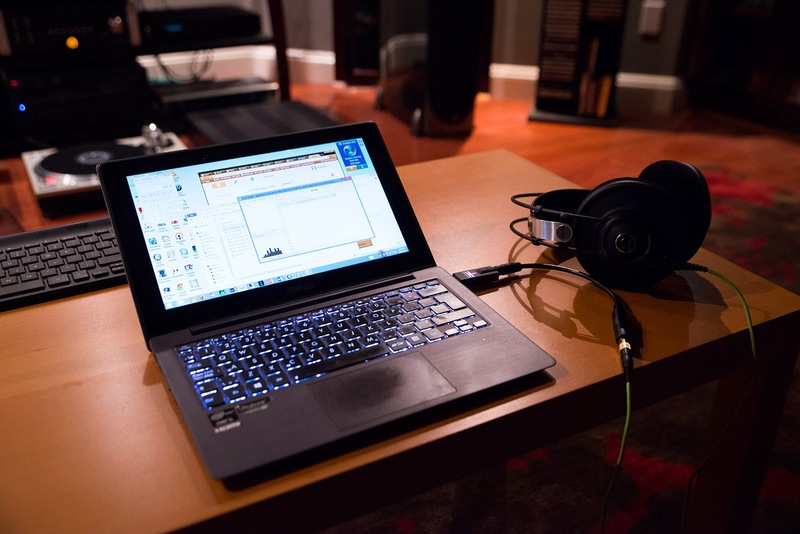 There you go, the objective and subjective evaluation of the AudioQuest Dragonfly v1.2. Overall, from an objective perspective, it doesn't measure as well as the AudioEngine D3. The Dragonfly's 24-bit dynamic range is lower by about 0.5-bits in comparison, plus harmonic and intermodulation distortions measure higher. Furthermore, there's a bit more stereo crosstalk with the Dragonfly. Realize of course we're looking at tiny differences in terms of real-world audibility. For example, what audible difference is there between 0.011% THD (Dragonfly) versus 0.0009% (D3)? Would our headphones/speakers be able to manage such low level of distortion or our ears capable of such resolution? 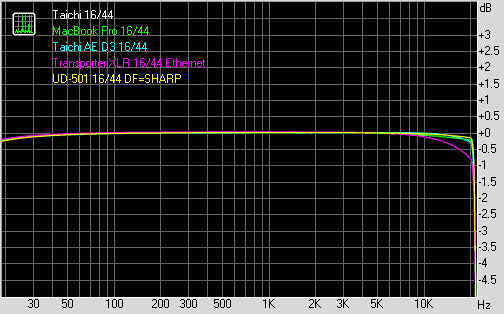 Remember that a typical NOS DAC like the old TDA1543 measures 5-10 times higher in terms of THD and IMD yet they can still sound OK (and in fact some audiophiles swear by them). The other difference was increased stereo crosstalk with the Dragonfly measured around -72dB. 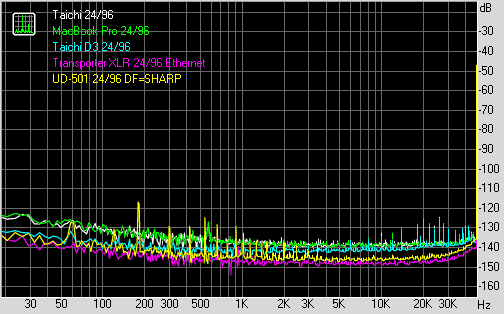 Compared to the others around -90dB or less, this sounds like a lot. 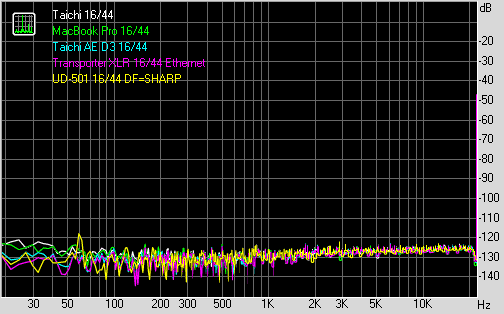 Again, remember that a typical LP cartridge has "only" about 25-40dB channel separation at 1kHz. Therefore, again it's unlikely you're going to notice an audible problem. The one area of concern for me was the channel imbalance on objective testing at 0dBFS on the oscilloscope with this unit. Even so, it was difficult to detect a difference at normal listening levels through my Sennheiser HD800 and AKG Q701 playing stereo music but could be detected with mono recordings using the Etymotic ER-4B IEM. This could really be a problem if one's headphones also had a slightly louder left channel imbalance issue. Perhaps others can double check if this imbalance is present with their own Dragonfly units. I cannot help but suspect that the advertised "direct-coupled circuitry" where the op-amp is integrated into the ESS Sabre chip might be the reason for the relatively poorer objective test results. Compact size is achieved with this kind of arrangement but physical factors like significantly higher heat production could I suspect limit absolute sound quality from the DAC chip itself. I don't know if AudioQuest could have also "tweaked" the settings for the DAC chip to bias towards a more pleasant sound. Here's the bottom line... If you're looking at the AudioEngine D3 versus Dragonfly v1.2 and want the best objectively accurate sound quality, go for the AudioEngine D3. It measures and sounds like a much more expensive separate DAC on a stick! However, the main caveat is that it clips at 100%, so keep it around a maximum of 92% and you'll hear some really clean audio. Remember what I also said previously about allowing a portable device to clip - it may not be an unreasonable trade-off when you just need that extra bit of volume in a noisy environment where a little distortion is fine. The D3 is also a little bit more expensive around here currently (only talking about $20 difference). On the other hand, the Dragonfly is built very well and I would rate the look and feel of the unit higher than the D3. The color-changing dragonfly indicator based on sample rate is also a nice touch. Furthermore, it is slightly smaller and significantly cooler to the touch than the D3 after an hour of music being pumped through. Output impedance isn't much different between the two (both around 10-12 ohms), so check if you have higher impedance headphones (80+ohms) for best performance. The D3 can play a bit louder but remember this is with the potential for clipping at 100% volume. My usual benchmark for a "good enough" headphone amp is one where I would not need to put the volume to 100% to enjoy my AKG Q701s... And the Dragonfly is clearly good enough in this respect for what I listen to. Happy listening everyone... Considering the 24-bit performance from the AudioEngine D3 and Dragonfly, consumer audio technology is clearly getting better, smaller, and more affordable!